Keto Quiche, Suuuper Creamy With a Bacon Crust! Holy cow, how on earth am I just thinking to make keto quiche with a bacon crust!? WOW! I mean wow. This recipe is going to seriously rock your world! Because low carb pie crust is super delicious and all, but it takes time to make, roll, press, etc. 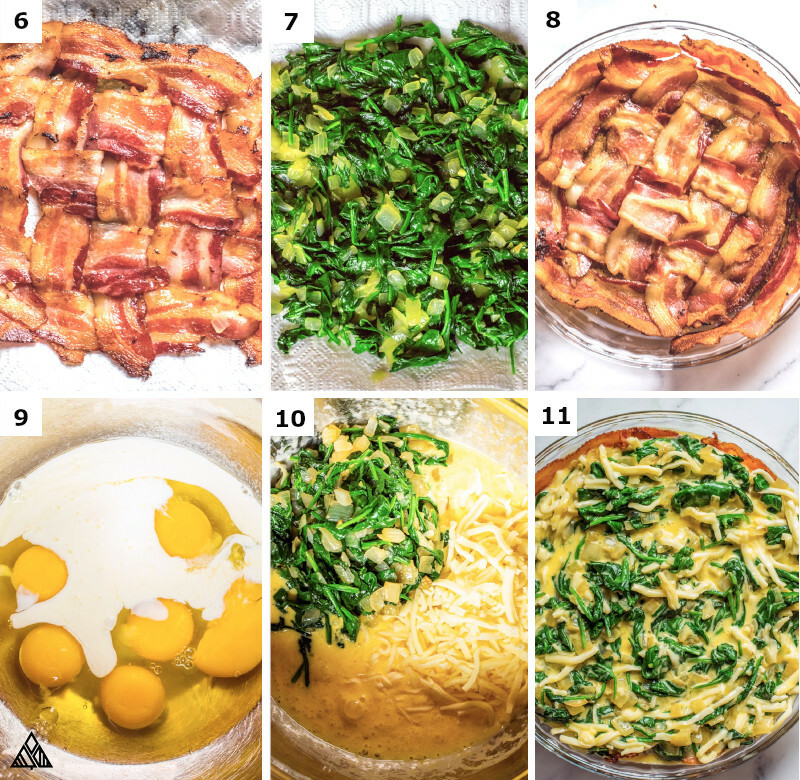 When you use bacon, all you have to do is weave it, bake it and slide it into your pie pan! So turn on that oven and let’s get this low carb bacon quiche party started! 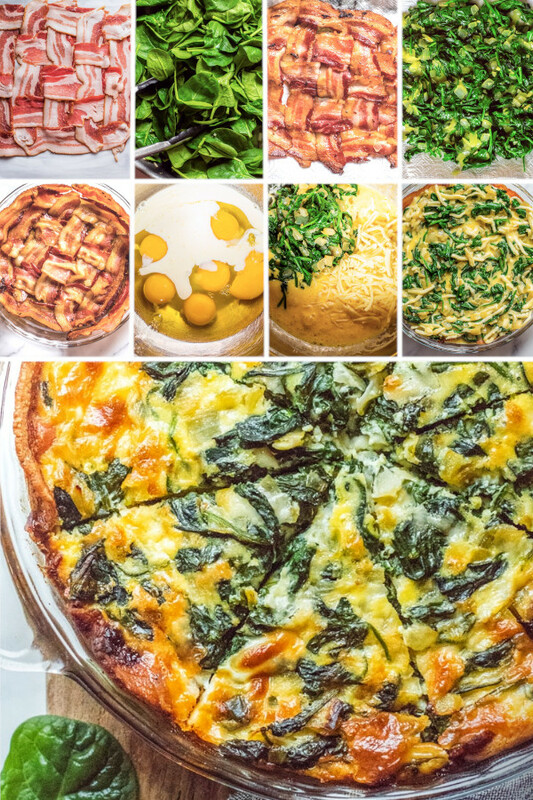 Fair warning, my instructions for making this keto quiche make it sound WAY more complicated than it is — Check out the crustless keto breakfast quiche photos below for a visual, it’s actually SUPER easy! PS, how the heck would you describe the bacon weave, anyone have a better way?!? Lay 5 pieces of bacon side-by-side on a baking sheet lined with parchment paper. 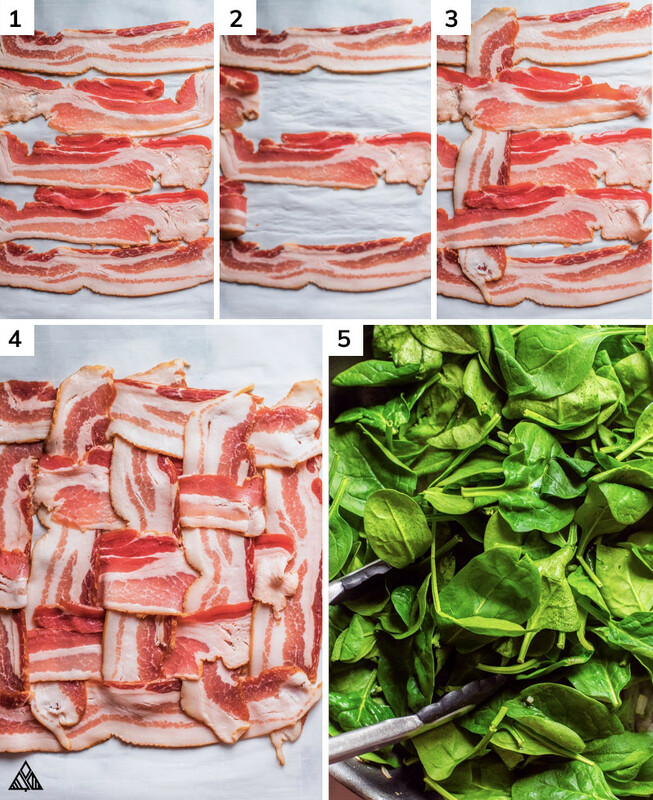 Then, fold every other piece back, and lay a piece of bacon across the other slices. Unfold the folded bacon, and fold the pieces that weren’t previous folded. Repeat this process until you’ve got a weave with all your bacon, except 4 slices. Lay remaining slices flat next to the weave on the baking sheet — these slices will be the “sides” of our keto quiche crust. You want the bacon to be cooked, but still pliable (in other words, not burnt). Move bacon into pie pan. Instead of a quiche/tart pan, we’ll want to pour the keto quiche filling into a pie pan, as quiche pans have a removable bottom that’ll spill the filling. Before forming the crust with the bacon, I like to remove as much bacon grease as possible — I do this by pouring the grease from the pan into a cup, sliding the bacon onto a paper towel lined plate, and dabbing the top with more paper towels. Then, the keto quiche crust is ready to slide into the pie pan! Place the weave on the bottom, and the extra pieces along the sides. Sauteing the keto vegetables before adding them to our keto quiche will make a HUGE difference in flavor, while releasing excess liquid that would otherwise make out quiche soggy. All that’s left is to combine the remaining ingredients in a bowl, pour them over the bacon crust, and bake the keto quiche until the edges are golden and the center is solid. Switch the low carb vegetables. 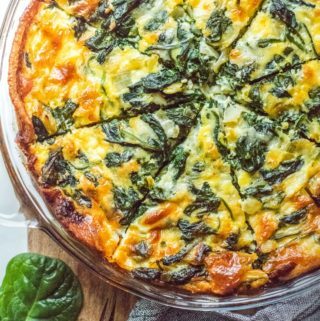 Be sure to cook the liquid out of any vegetables before adding them to your keto quiche. Substitute veggies rather than adding more. Swap the cheese. Traditionally, Swiss cheese is used in quiche, but we prefer mozzarella for low carb breakfasts. Feeding a big crew? Low carb breakfast casserole is the way to go. 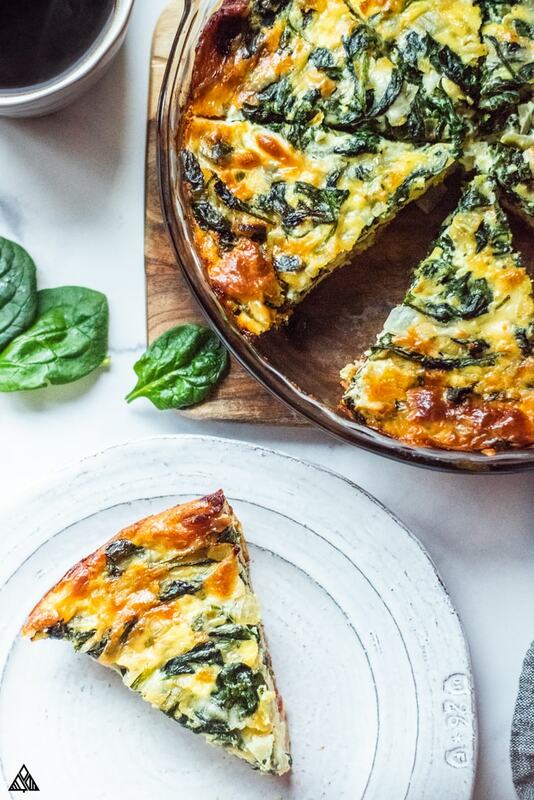 To turn this keto quiche into keto casseroles, you’ll want double the recipe, bacon and all. Use 2 rimmed baking sheets to cook the bacon weaves — since the bacon isn’t long enough to fit an entire casserole dish, we’ll essentially make 2 weaves that will lay next to each other in the pan. Then, all that’s left is to pour the keto quiche filling into your casserole dish and bake until the center is solid. Or, make crustless mini quiche in a muffin pan. To do this, we’ll skip the weave (woohoo! ), and bake the bacon laying flat on a rimmed baking sheet. Spray the bottom of each muffin tin, and form the cooked/pliable bacon around the sides of each tin. Pour the keto quiche filling into each tin and bake for about 25 minutes, or until they’re firm in the center. 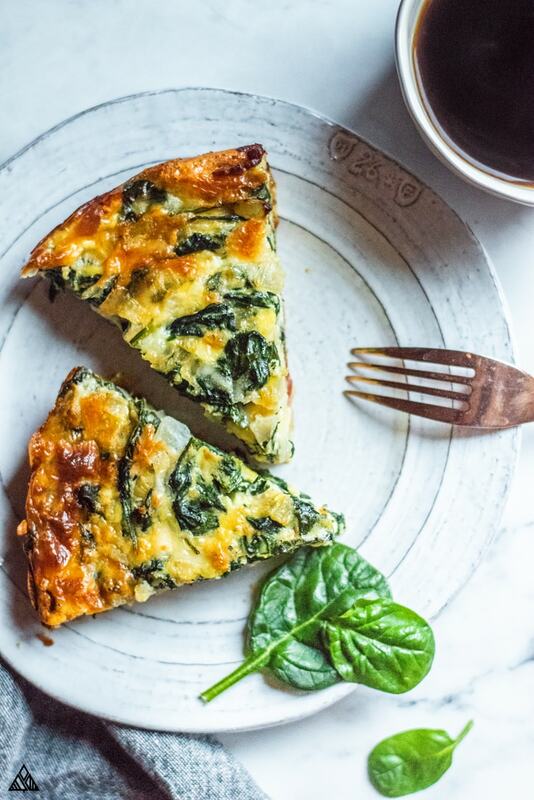 This crustless spinach quiche is perfect for low carb meal prep, as you can make it at the beginning of the week, then quickly slice and reheat in the morning! I often freeze individual slices of keto quiche and defrost them as needed. I’m not the biggest fan of microwaves, so I reheat crustless quiche in the toaster oven/oven by warming it to 350 F, and placing a slice on a greased baking sheet for about 15 minutes, or until the center is no longer cold. Looking for more low carb breakfast ideas? Also, if you’re brunch-ing, check out my guide to low carb alcohol for some suggestions. Rise and shine friends, it’s keto quiche time! I hope this recipe brings you and your family a little joy in the morning, be sure to let me know what you think in the comments below! 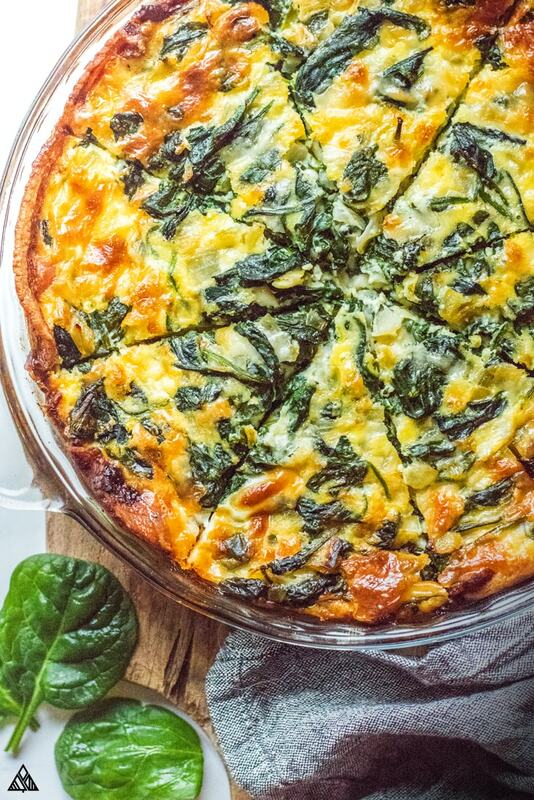 Love crustless quiche recipes as much as we do? I have a TON for you to choose from, but keep in mind you can always pour your favorite quiche filling into a greased pie pan! Check out my low carb quiche lorraine recipe, and skip the crust. 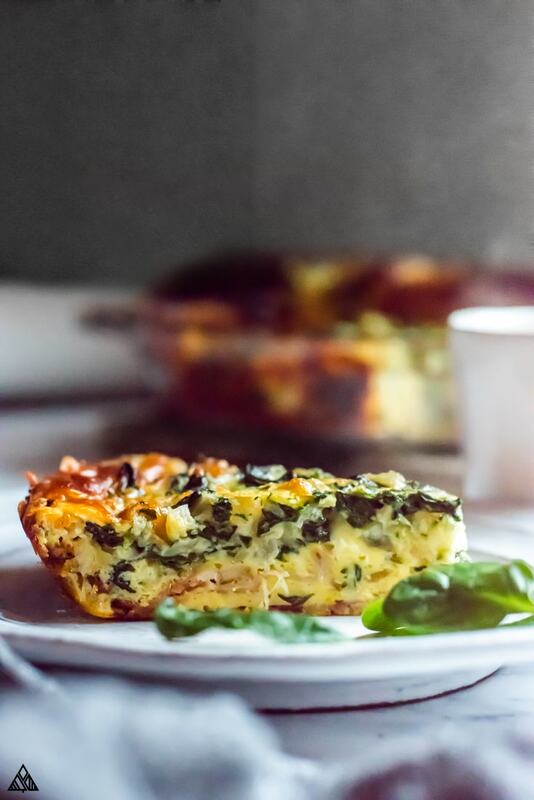 Then you’ve got a low carb version of a crustless quiche lorraine everyone will love! You had me a bacon crusted!! This looks amazing!